In my early twenties my roommate invited myself and another friend to her parent’s home for dinner. It would be a themed potluck, wherein the host, and each guest, would make and bring a dish representative of their heritage. Initially, I was nervous. My roommate was second generation Italian, her father had been born in Italy and moved to Canada as an adult to teach at a university; the other friend on the guest list had been born in Albania and moved to Canada to attend university. Their connections to what they considered to be their heritage were more direct than my own; their options for dishes to bring seemed more obvious. Born and raised on the east coast of Canada, I had always felt as though my “Canadianness” amounted more to an absence of heritage than an easily identifiable set of cultural associations and practices. What dish would represent my Canadian identity? Eventually I figured it out. I settled on bringing a shepherd’s pie: a layer of ground meat topped with a layer of mashed potatoes, sometimes with a layer of peas and carrots in between. I was confident that this was an appropriate dish for the theme of the evening. Not only is much of my ancestry Scottish, English and Irish, but this was a dish that I actually grew up eating. When the shepherd’s pie was brought to the table, my roommate’s father was surprised and confused. He had assumed that I was bringing a seafood course - perhaps lobster, he suggested. Setting aside what felt like the absurdity of two university professors in their 40s expecting an undergraduate to bring enough lobster to feed five people to their house when they themselves were serving a simple pasta, I suppose his surprise was understandable, in a way. The east coast of Canada is known, at least in the vague sense that outsiders can know a place, as a fishing region. But, my family is not made of fishermen, seafood is relatively expensive so I rarely ate it growing up. We did have the occasional father’s day lobster dinner with extended family, but I always found the sloppy process of cracking open the shells and digging the meat out from their insides to ruin my appetite. Most of my early-life experience eating seafood came in the form of a dreaded supper my sister and I referred to as “cheese fish.” From what I can remember, I assume it was some sort of small, tasteless, frozen white fish fillet, perhaps halibut, served with cheddar cheese grated over the top and broiled. Bringing fish to the dinner party hadn’t even occurred to me - mostly because I wouldn’t have known what to do with it. Because of my unfamiliarity with seafood preparation, when I came across a recipe for this Finnish salmon soup and decided that I needed to make it immediately, I was initially intimidated by the use of fish heads in the traditional Finnish preparation. Granted, since the cheese fish days I have mastered various entry-level seafoods, frozen shrimp and ready-to-cook salmon fillets are some of my favourite proteins. But, I’ve yet to level-up to tasks like filleting or de-scaling a fish myself or cooking a whole fish. But, if, like me, you’re nervous about cooking with a fish head, let me assure that you that it was far easier than I anticipated, cheaper than cooking with pre-made fish stock, and this soup is so good that it is absolutely worth the effort of stretching your cooking comfort zone. Use water or vegetable stock. I have not tried the soup using this method, but I assume it would have significantly less seafood flavour, and would not have the creamy texture of a stock made with fish heads (or bones). Use a pre-made fish or seafood stock. In an earlier iteration of this recipe I used mostly water to make a vegetable stock and then added two cans of seafood stock (I used the Bar Harbour brand). The soup is still delicious using this method, but the stock was very expensive at 5-6 dollars per can. Make a stock with fish heads (and bones if you can get them). This is the route I took with the recipe below. The resulting broth has a stronger fish flavour than the pre-made seafood stock creates, and also has a thicker, more gelatinous texture (especially as the soup sits for leftovers). Fish heads are significantly cheaper (I got mine for $2/pound) than pre-made seafood stock. All you need to do to get the fish heads is ask for them. I called ahead to the seafood department at my grocery store to find out if and when they were available for sale. Be sure to ask if they will remove the gills for you, as leaving them in will impart bitter flavours to the stock. I neglected to do this and needed to cut and pull them out of the fish head myself. It is not difficult to do, but the process is rather unpleasant. To prepare stock: Ensure the gills are removed from the fish heads. This was the best video I could find that showed how to remove gills). Place heads in a large bowl and cover with water. Add salt. Soak for 1 hour. In a large heavy stockpot or dutch oven, heat butter over medium heat. Add vegetables to the pot and sweat until they begin to soften, 5-7 minutes. Add fish head and cook, stirring frequently, until fish begins to turn white. Add enough water to cover the vegetables and fish (about 12 cups) and bring to a simmer. Simmer for 40 minutes. Set a fine mesh sieve over a large heat-proof bowl. Pour fish stock through sieve, allowing the solids to collect in the sieve, and the liquids to drain into the bowl. Discard solids and set fish stock aside. In the same pot or dutch oven, heat butter over medium heat. Add leeks, sweat until they begin to soften, 5-7 minutes. Add potatoes and carrots, and return the fish stock to the pot. Bring to a low simmer and cook until potatoes are soft, about 10 minutes. Add fish trimmings and continue to cook, at a low simmer, until fish is cooked through. About 5-7 minutes. Be careful not to overcook the salmon, you want it to have a silky, not dry, texture. A lot of instructions for making fish stock warn about using the heads or bones of oily fish (like salmon) for making a basic fish stock, However, oily fish is fine to use if, as in this case, the soup or chowder you will be making with it features oily fish. When making chicken or vegetable stock I usually cut the vegetables fairly large - in halves or quarters. Here, I cut the vegetables small. The smaller size means more surface area, which means more flavour in the stock, which is especially important for fish stock, because it cooks much more quickly than chicken or beef. Serve the salmon soup with biscuits, bread or rolls. I like to serve mine with Bon Appétit’s parker house rolls. Storage: the stock will keep in the refrigerator for up to 5 days and in the freezer for up to 3 months. I haven’t tried freezing the soup but, if you do, you might want to freeze it before adding the cream, which tends not to freeze well, and add the cream after the soup defrosts. Adapted from: Peter’s Food Adventures, The View from Great Island, Serious Eats, Susanna Foo. Before I began making gnocchi at home, I’d only eaten it a handful of times. Once, packaged gnocchi prepared for me by an Italian friend, served with a simple tomato sauce; on a few additional occasions, a gnocchi dish I ordered at a nearby gastropub, served with roasted vegetables and a rabbit ragù. I didn’t grow up watching an Italian grandmother use the palms of her hands to roll soft potato dough into long snakes, cut them into pieces – three quarters of an inch long - and drop each one into a well-salted pot of boiling water. I haven’t eaten gnocchi during hot summer months spent studying or vacationing in Italy. Nor have I ordered it regularly in fine dining restaurants where it was expertly prepared by classically-trained chefs. Outside of food-loving Italian families and relatively wealthy and culinarily adventurous households, gnocchi is an unfamiliar food. Social theorist Pierre Bourdieu argued that the material conditions of socioeconomic class shape our relationship to culture, especially in its highbrow or “legitimate” forms. The wealthy acquire knowledge of such culture through immersion. They are, from the beginning, present in spaces where highbrow culture is being discussed and consumed - their parents formal gatherings, the golf course or country club, art galleries and theatres. They develop cultural competence, an ability to see and understand the elements of a cultural product that are relevant to its evaluation as art, through a socialization process that is like a form of osmosis so imperceptible that it is easily mistaken for an innate ability. These conditions often result in a sense of mastery over highbrow cultural forms that translates into an ease, a willingness to play, to take ownership, the freedom to bend and break cultural rules with impunity. The middle classes acquire knowledge of highbrow culture at more of an arms length. They learn its logic and rules deliberately and consciously, often within scholarly contexts normally encountered later in life. An art history elective taken in college, cookbooks purchased in an attempt to teach oneself to cook. These conditions often result in a rigid adherence to rules and an ever-present awareness or fear of the possibility of consuming culture wrong. The rules and principles of culture can be taught, the feeling that they are second-nature cannot. The working classes tend not to acquire much knowledge of highbrow culture at all, and often, perhaps as a result, approach it with indifference, disdain or outright rejection. They might, for instance, scoff at the market value of something like a Piet Mondrian painting, rejecting its artistic value by insisting that anyone could paint such a thing. These relationships to culture are not merely different, they are treated as though they are ranked; structured hierarchically. Some cultural forms are seen as more legitimate than others: prestige drama is more legitimate than reality tv; wagyu beef and caviar are more legitimate than hot dogs with ketchup, mustard, relish and a 2 litre pop. And, familiarity with the rules of highbrow culture confers status, and thus advantages, in a way that familiarity with lowbrow culture does not. Detailed knowledge of fast food burgers won’t translate into economic advantages in the workplace, the same knowledge of scotch, however, might. As tempting as it is to dismiss as insignificant the cultural products we consume and the ways we consume them, they are part of the complex mechanisms by which inequality operates. My early life experiences straddled the line between working and middle class. Before reading Rosner’s tweets I assumed that if I were eating gnocchi wrong, it would be because I was unfamiliar with the proper texture of authentically made gnocchi. I hadn’t considered the possibility that the telltale sign of my tenuous grip on the rules of eating might not be that I’m eating gnocchi wrong, but that I’m eating it at all. Gnocchi are mini potato dumplings shaped like pillows that are usually imprinted with ridges, a technique that allows more sauce to adhere to their outsides. As a culinary form, gnocchi are essentially naked or unfilled dumplings; disembodied soft fillings unencumbered by pastry casings. Such unfilled dumplings are found in many of the world’s cuisines: African Fufu and kenkey are variations of large mounds of dough made from plantains, cassava or maize, meant to be eaten with your hands, and served with meat or fish stews and gravies. Potato and bread-based unfilled dumplings are common in European cuisines, particularly those of central and eastern Europe: Polish kopytka are potato dumplings very similar in composition to gnocchi, but shaped like “little hooves,” and served with buttered bread crumbs or gravy; German kartoffelkloesse or Kartoffelknoedel are potato dumplings served with roasted meats; Serviettenknödel are large dumplings shaped into a long roll and wrapped inside a napkin; Czech Knedlicki; Slovakian halušky. The list could go on. This global assortment of unfilled dumplings emerged, in part, independently, as resourceful cooks developed strategies for using common locally available carbohydrates to stretch out more expensive proteins, but also through culinary hybridization as dumpling variations followed the patterns of the migration and mixing of people around the world, over time, for reasons of economics, war, and politics (Gallani, 2015). Wherever people went, so too did their dumplings. Generally associated with Italian cuisine, Northern Italy seems to be the most commonly cited location of gnocchi’s origin. Origin, and the related notion of authenticity, are culinary characteristics that often underpin the rules of “eating it right,” but they are difficult to define with certainty and precision. Where does gnocchi come from, precisely? What makes gnocchi authentic, definitively? Within Italy there are many regional variations of gnocchi. Some are made with potatoes, some with bread, still others with ricotta cheese, often mixed with greens and referred to more accurately as gnudi. And, each of these variations can be paired with a variety of sauces: tomato, cream, ragù, brown butter, pesto. Moreover, while the dish itself may have been conceived in Italy, the main ingredient of its most recognized version - the potato – was first cultivated in South America. Potatoes were brought to Italy and adopted into Italian cuisines sometime during the 16th and 17th centuries. And, turning full circle, when great numbers of Italians emigrated to the Americas in the late 19th and early 20th centuries, many of them went to South America, taking their gnocchi recipes with them. Today, it is a tradition in Argentina, to serve gnocchi on the 29th of every month. Called day of gnocchi, or Dia de Ñoquis, it is a tradition that, like the dumpling itself, was born of resourcefulness, of the need to make a meal out of what was left, just before payday. Most produce and dishes have a history of criss-crossing the globe which complicates and undercuts, if only to a degree, whatever rules of “eating it right” are based on notions of origin and authenticity. But these are not likely to be the culinary characteristics behind the criticism lobbied at gnocchi. Such criticism has more to do, I assume, with their flavour and, especially, their texture. Consisting primarily of cooked potatoes, gnocchi often lacks both. But, like origin and authenticity, preferences for textures and flavours are complicated and are inextricable from socioeconomic class and cultural competence. As a child, I developed a habit of mixing everything on my plate together into a mush. That this was often possible speaks, I think, to the relative texturelessness of white people’s food. I remember sitting in my grandparent’s basement with a group of younger cousins, huddled around a coffee table that served as that thanksgiving’s designated kid’s table, instructing them on how to mix their meal together. I was like a less culturally insensitive, but just as unnecessary, chef Tyler Akin telling the Bon Appétit readership how to properly eat Pho. Meat-and-potatoes represent the cultural identity of many white, working and middle-class North Americans, and I was there to instruct the as-yet uninitiated on how to turn them into mush. My cousins seemed unconvinced. Years later, I sat at a long table of teenagers dressed in black tuxes and fluffy pastel gowns, mixing a piece of chocolate cake together with the vanilla ice cream that had once sat respectably on top of it until it resembled a brown and white speckled paste, as if it had already been chewed. My prom date seemed disturbed. Well into my adulthood, when I wanted a late-night snack, I would take leftover mashed potatoes and stuffing out of their plastic Tupperware containers, mix them together in a bowl, flavour the concoction with ketchup and poultry seasoning, and pop it into the microwave. There was no one around to judge. This could be the sort of habit familiar only to me. But, then again, many of my early food experiences, shaped as they were by the material conditions of my young working-class but upwardly mobile parents, defied the culinary rules of texture and flavour that seemed to come so naturally to those around me with more culinary cultural competence. Perhaps these early experiences predisposed me to like the creamy textureless feel of gnocchi; to read the phrase “texture-less blob of tiny potato poops,” knowing that it is meant pejoratively, yet wonder where the problem lies. I don’t mean to call out Rosner; her food writing is unpretentious - the brilliant Olive Garden piece is a case in point. Perhaps the tweets were even meant, in part, to undermine the potential boastfulness of claiming to love such a relatively uncommon dish in the average North American diet. Nor do I mean to suggest that anyone’s rules of eating should be taken too seriously. Just as one’s class position can be complicated, one’s relationship to taste and food culture can be ambivalent. While I am often led by the middle-class in me to anxiously wonder, “am eating it wrong?,” the working-class in me insists upon a degree of irreverence towards legitimate culture – my penchant for turning a meal into a pile of mush is a case in point. When it comes to personal taste, rules shouldn’t matter; anyone should be able to eat whatever they want, however they want, and preferences, however seemingly incompatible, don’t need to be mutually exclusive. I love gnocchi and I love sauce. 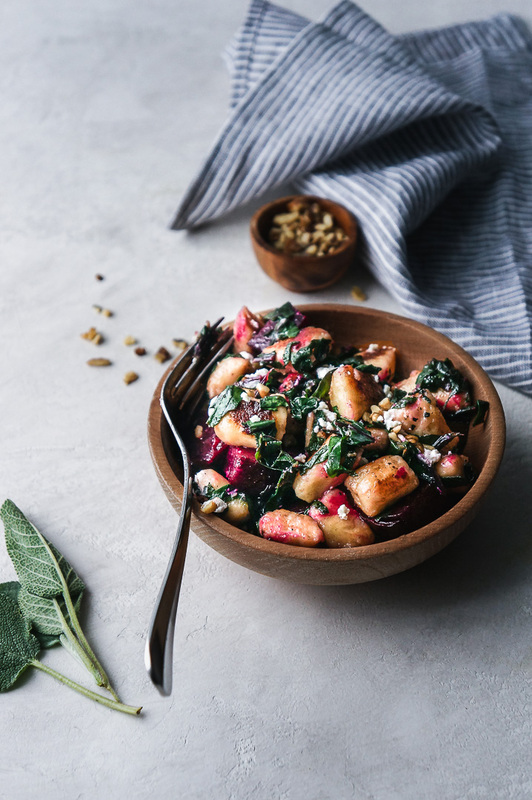 This dish has soft gnocchi with crispy outsides, earthy beets, sautéed greens, a sage butter sauce, and crunchy chopped walnuts. If you opt to save time with a pre-made gnocchi, I wouldn’t blame you, but if you opt to make your own (it is so much better! ), this recipe makes enough for 4 servings. Because Gnocchi is time consuming and does not keep well as leftovers, I like to make a larger batch than I need, cook half, since I only need to feed two people, and freeze the other half. That way, I get two meals out of the time I spend making the gnocchi. Double the vegetables and sauce and cook all of the gnocchi if you are feeding four people. Gnocchi is a good way to stretch out leftover protein. I made some recently to stretch leftover Austrian Goulash into another meal after I ran out of the dumplings that had accompanied it. Any leftover stew or meat with sauce could be paired with the gnocchi. Alternatively, you could make only the gnocchi and the sage butter sauce and serve with a salad. 8 sage leaves, cut into thin strips. Preheat the oven to 450. Prepare the potatoes and beets for roasting: scrub potatoes and prick them all over with a fork. Set on a rack placed on top of a baking sheet. Cut the tops off the beets, setting the leaves aside, and peel. Coat beets in olive oil, sprinkle with salt and pepper, and wrap inside tin foil. Place the beets and tray of potatoes into the oven. Roast until they are easily pierced with a fork. About 45-60 minutes (depending on their size). Chop beets into bite-sized pieces and set aside. Fill a large pot with water, salt generously, bring to a simmer. Meanwhile, prepare the gnocchi dough: While potatoes are still hot, cut them in half lengthwise. With a large spoon, scoop out the cooked flesh and run it through a potato ricer, spreading the riced potato on a clean workspace in a rectangular shape. Sift 1/2 cup of flour over potatoes. Drizzle egg yolks evenly over potatoes and flour. With a bench scraper, chop down into ingredients to mix them together. Using the bench scraper, bring dough together in a loose ball and lightly “knead” by folding the dough over onto itself and pressing down. Sift the last 1/4 cup of flour over dough and repeat the fold and press motion until dough comes together. Shape into a log. Working with 2 inch sections of the dough at a time, use the palms of your hands to shape the dough into a long snake, about 1/2 inch thick. Do do this, start in the middle of the dough, pressing down, rock your hands back and forth while moving them outward. Repeat motion until you have an evenly thick, long, cylindrical shape. Use bench scraper to cut the snake into 1 inch sections. Transfer gnocchi to 2 floured baking sheets (one for freezing and one for cooking). Repeat until all of the dough is shaped. If only serving 2, set aside half of the gnocchi to freeze. Melt 1 Tb butter in a 12 inch skillet over medium high heat. Working in Batches, scoop gnocchi into a sieve and drop into the simmering water. Once gnocchi float, continue to simmer for 20-30 more seconds. Use sieve to transfer gnocchi to the hot skillet in a single layer, making sure to drain as much water as possible before dropping them in. Season with salt. Brown gnocchi 2-3 minutes per side. Transfer to a large plate. Repeat with remaining gnocchi. Prepare the sage butter sauce. Melt butter in the skillet used to brown the gnocchi. Add thinly sliced sage leaves. Cook until butter begins to brown. Add greens and sauté 2-3 minutes until wilted. Add browned gnocchi (along with some of the cooking water if it is too dry) and toss to coat with sauce and mix with the greens. Transfer to a platter with the beets, top with spoonfuls of goat’s cheese and walnuts. Serve immediately. To freeze gnocchi: spread uncooked gnocchi on a sheet pan so that they are not touching each other, place pan in freezer until the gnocchi are frozen on the outside, about an hour (this is so that they will not stick together). Transfer gnocchi to a freezer bag. The Gnocchi will keep well in the freezer for up to a month. To cook frozen gnocchi: do not de-frost in advance. Drop frozen gnocchi into a pot of boiling, well-salted, water, remove with a slotted spoon once they float to the top and transfer in batches to a pan on medium-high heat. If you were to come over to my house, open the freezer, and look into the side-door, you would find frozen bananas. Not a couple of stray frozen half-moons scattered about, but many, stacked tightly together like a brick wall, a freezer door packed to capacity with black bananas in various stages of decomposition. Some recognizably plump and cylindrical, others small, wrinkly and mangled. As far as I know, bananas don’t “go bad” once you store them in the freezer - though my frozen banana tower is evidence of my willingness to test that theory. I like to think that I’m not a picky eater, but I do require my fruit to be just the right texture. I like bananas on the verge of being ripe, completely yellow but still firm. Once they start to soften and brown they go straight into the freezer. I don’t like the intense sweet flavour or the gooey texture of a blackening banana. Consequently, one or two - and sometimes more - bananas from every bunch eventually find their way into my freezer. Why then, do I keep buying bananas? It seems irrational. But whatever guilt I might otherwise feel about inevitable banana wastage is tempered both by their inexpensiveness compared to most other fruit, and their potential for a second-life as banana bread. Given the popularity of bananas - the world’s most commonly eaten fruit - I’m probably not the only one who treats banana bread as a kitchen waste fail-safe. My last recipe post - Peanut noodles with Sichuan Chili Oil - emphasized the importance, for those of us who belong to a dominant culture, of being mindful of how we encounter other people’s food. Of paying attention to the attitudes and assumptions we bring to these encounters and the ways in which we express our reactions and preferences. In writing about banana muffins, such a consideration seems unnecessary. Unlike noodle dishes, banana quick-breads feel like “my food.” Banana loaves and muffins are a staple in many working and middle-class Anglo-North American homes and have been since chemical leaveners became available to home cooks in the 1930s. The ubiquity of the banana in North America makes it easy to overlook that they are not native plants. Banana plants require year-long frost-free temperatures and thus cannot be grown, commercially, very far from the equator and North Americans only began to eat them regularly in the late 1800s. How then did banana bread earn its place as one of the fundamentals of North American home baking? Bananas taste good, but no more so than other, less popular, fruits. They are valuable nutritionally for their potassium. 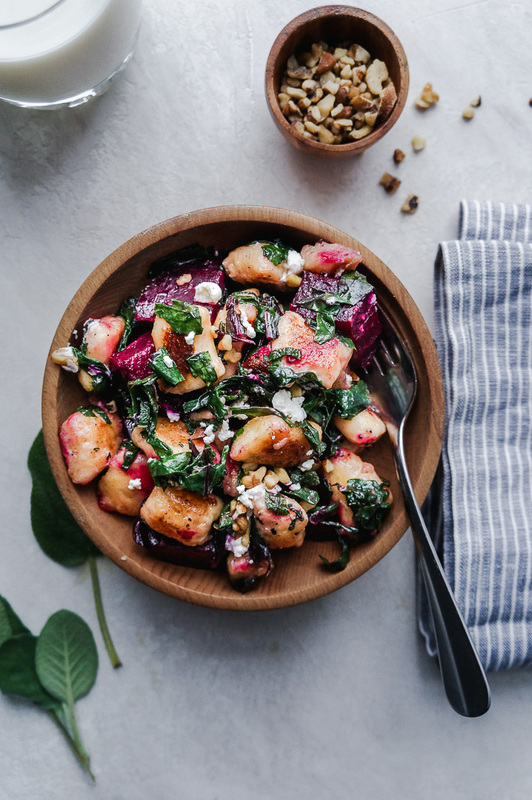 But many other fruits and vegetables, including some that are suited to Northern climates, such as potatoes, spinach, beets, winter squash and white beans, contain as much, or more, of this essential mineral. Explaining North America’s wholehearted embrace of the banana requires exploring not only the culinary and nutritional properties of the fruit, but also its politics. Food is never “just food.” Food is always also cultural and political. Bananas illustrate this point in an unusually literal way. Countless Western military interventions into the Caribbean, South and Central America over the 20th century were motivated, at least in part, by the desire to maintain control over the outrageously profitable Banana export trade. The CIA-led overthrow and exile of land-reform friendly and democratically elected Guatemalan president Jacobo Árbenz, in the 1950s; the 1961 bay of pigs invasion which sought, in part, to reverse Fidel Castro’s decision to nationalize banana and sugar plantations; the 1928 Colombian banana massacre, in which thousands of striking United Fruit workers and their families were murdered by the Colombian government, under threat of the US military, as they left a Sunday church service. Such interventions were designed to protect the financial interests of Western-owned fruit companies and to ensure that bananas remained the cheapest fruit available to Western consumers. The banana’s popularity rests therefore on forms of colonial, and neocolonial, power. Western power to control land, resources, agricultural practices and labour in banana growing regions as well manipulate mass markets of food consumption. Such power at the point of banana production was acquired through deals struck between mostly American-owned fruit companies and the governments of the Caribbean, South and Central America. The particulars of these deals varied, but they formed a common pattern: fruit companies were granted concessions - access to land and resources in the form of subsidies, monopolies or ownership and exemptions from taxes and duties - in exchange for constructing infrastructure such as transportation and communication networks, like railroads and telegraph lines, and electricity. Though governments sought out these deals for the development they would bring, such development came at the expense of the environment and biodiversity, labor rights, the economic viability of small-scale growers, local democracy and, ultimately, national economic sovereignty. Influence over banana consumption required power of a different kind: symbolic control through marketing and cultural representation. As concessions were secured allowing for the cheap production of bananas on an enormous scale, fruit companies needed to ensure that demand matched supply. They created publicity and education departments that produced campaigns designed to sell more bananas by manipulating their symbolic value (Soluri, 2005). In both marketing and popular culture, Banana imagery was used to symbolize the cultural inferiority, or barbarism, of the peoples of the tropics, a tactic that promoted banana consumption while symbolically legitimizing the exploitative practices of the banana export industry by suggesting that it brought progress and civilization to backward peoples. For instance, early travel literature and popular culture references used the relative fertility of tropical lands and the immense productivity of the banana to suggest that the people of the tropics were both lazy and uninspired. Unlike farmers throughout the history of Western agriculture, who had to labor intensely to eke out a living from dry lands and wheat fields, the inhabitants of banana growing regions merely had to walk out of their huts and pick the fruit off of the trees. In part, this reasoning makes virtue out of necessity. It is also a misconception. One that was frequently made in colonial encounters with indigenous agroecological practices. Early Western explorers to banana growing regions misinterpreted what they saw because they viewed the lands they were “discovering” through the lens of their own culture, and when they did not see their own agricultural practices reflected back at them, they assumed none existed. Banana Muffins Do not Have to be Boring. I always have more frozen black bananas than freshly baked banana breads. The truth is, I don’t love quick bread. I get its appeal, but I find it sort of boring and don’t want to spend my baking time on boring things. In an effort to make more interesting use of my frozen bananas, I created this cranberry banana muffin recipe. The first addition to a basic banana quick bread recipe is the cranberries. Cranberries are one of my favourite berries. Their use should not be limited to holiday-food. I’m always looking for ways to use them, and fresh or frozen cranberries work beautifully in a quick bread. The second addition is the streusel. Making a streusel does add an extra step to the muffin baking process, which may put off those looking for a one-bowl super-quick recipe, but it adds a crunchy texture to the muffins, and makes them look fancier. Finally, I often find baked goods recipes to be too sweet. For these muffins I lowered the sugar in the base recipes I used and added more tart flavour, with the cranberries of course, but also with lemon zest in the batter and lemon juice in the streusel. I experimented a bit with changing the baking time. I’ve read that starting muffins on a higher temperature and then lowering the oven results in a higher rise. When I tried this technique, I did notice that the muffins rose a bit higher, but I also found that the higher temperatures dried out the streusel and the muffins overall were not as moist - but the technique might be worth trying if you leave out the streusel. Preheat oven to 350 degrees F (175 degrees C). Insert paper liners into a muffin tin, or coat the tin with shortening. To make Streusel: in a small bowl, combine pumpkin seeds, flour, sugars and baking powder. Add lemon juice and melted butter. Combine with a fork until the streusel holds together in clumps. Set aside. In a second small bowl, toss 1 cup of chopped cranberries with a spoonful of sugar. Set aside. In a medium bowl, sift the flour, baking powder, baking soda, salt, lemon zest and cinnamon. Whisk together and set aside. In a large bowl, combine mashed bananas, sugar, egg, vanilla and melted butter. Add the bowl of dry ingredients, mix together until combined. Be careful not to over-mix. Fold in the chopped cranberries. Divide the batter into the muffin cups. Each one should hold about 1/3 cup of batter. Sprinkle the streusel over the tops of each muffin. Bake for 25 to 30 minutes, until the streusel begins to brown and a toothpick inserted into the centre of one of the muffins comes out clean. Let muffins sit in tin for 5 minutes, then transfer them to a wire rack to cool. Sources: muffins adapted from All Recipes, streusel adapted from Food and Wine.